This week’s Supremo belongs to the world of Netball and although the Vitality Roses didn’t manage to win the Quad series outright, a win against the Australia Diamonds only months prior to the World Cup is a HUUUUUUUGE result and it was a tremendous performance from the ever-improving Roses that gave them the points on this occasion. It is for that reason that team Captain Serena Guthrie is this week’s Sports 360 Supremo. Arguably the best mid-court player in the world, the Roses skipper has chosen to leave sunnier, Sydney climes, in order to play out the 2019 season for Team Bath. A move that will undoubtedly benefit Bath, the Vitality Netball Super League and thousands of aspiring young Netballers across the land. Making her Roses debut in 2008 at the age of just 17, Serena Guthrie has amassed 50 caps for her country and is certain to add to that in the coming years. She has won Gold, Silver and Bronze medals in different forms of the game and will no doubt be looking to add to her collection this summer. Domestically, she starred for Team Bath until 2015, where her dynamic displays caught the attention of teams further afield and she moved to New Zealand in order to play for the Northern Mystics, having previously trained with the team in 2012. In 2017 Guthrie signed for Giants Netball in the Australian Suncorp Super Netball league, where she proved to be an outstanding competitor, winning the club MVP award for the 2017 season and growing into one of the best mid-courter players in the league and now the world. She played in the 2009 Netball World Youth Championships where she was vice captain and won gold in the 2011 World Netball Series, as well as a bronze medal at the 2011 Netball World Championships. She was also a part of the team that whitewashed Australia in January 2013, the first time the Diamonds had been whitewashed in a series since 2004. Guthrie was an influential contributor to England’s gold medal successes at the 2017 Fast5 Netball World Series and 2018 Commonwealth Games and was then appointed captain of the team for the series against Uganda in November 2018………… In short, she has serious pedigree. Before she even has ball in hand, Guthrie’s athleticism and prowess on court are abundantly evident and she leads this band of girls with real authority. 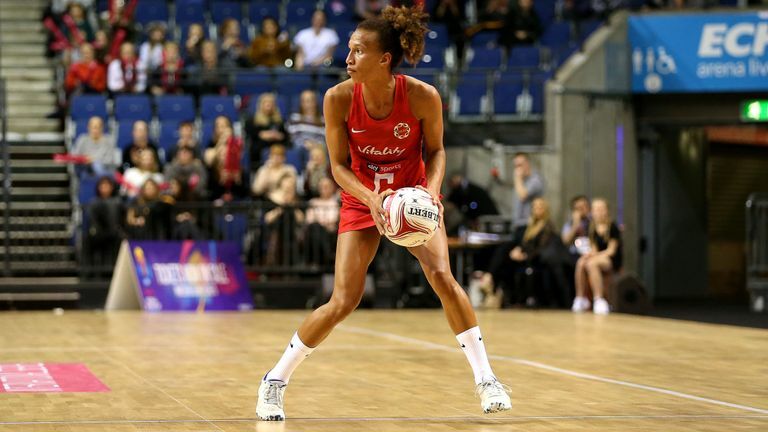 A big fan of the intercept, her ability to get England on the front foot is admirable and if this week’s Sports 360 Supremo is fully fit when the big tournament comes around, it could well be the most memorable netball summer we’ve ever known!